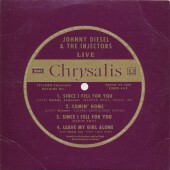 On August 16, Johnny Diesel & The Injectors played Sydney’s Hordern Pavilion as part of their “Rock & Roll Tour 1989” with special guests the Georgia Satellites and Alvin Lee from Ten Years After. The band was joined by the swinging sound of Terry Manning on alto saxophone and Jim Hilbun on baritone saxophone ably led by Bernie Bremond to form the F.A. Horns. The entire show was recorded live on Samuelson’s 24trk mobile unit by Al Wright. The next day Terry Manning flew with the masters to his Memphis studio, Ardent, to mix the tracks. “Leave My Girl Alone” is a duet featuring Johnny Diesel & Alvin Lee and appears on the 12″ and CD single only.